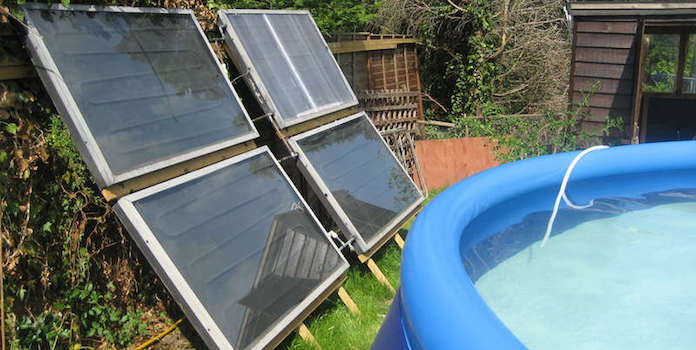 A comprehensive guide to building your own DIY solar pool heater. Owning a pool can be quite expensive, between all the chemicals, equipment, upkeep, and heating. In fact, heating alone can cause your swimming pool budget to balloon pretty quickly. A DIY pool heater powered by the sun could make these expenses less challenging, so read on to find out how you can create one yourself. Make no mistake, there are a lot of commercial options available that do a fantastic job of raising the temperature of the water so that you can swim whenever you wish. However, these types of heaters usually require a large upfront investment and often have a huge impact on your electric or gas bills. Propane Pool Heaters – For an average 400,000 BTU heater with a price tag of over $2200, it will cost you about $10 per hour to run, assuming the heater consumes around four gallons of propane in an hour of use (and propane averages about $2.50 per gallon as of the time of this writing), it will heat your pool about 5 degrees in that amount of time. Natural Gas Pool Heaters – For an average 400,000 BTU heater with a cost of over $2000, you can expect to pay about $4.00 per hour to run the heater at average natural gas prices, and it will also heat your pool about 5 degrees in that time. 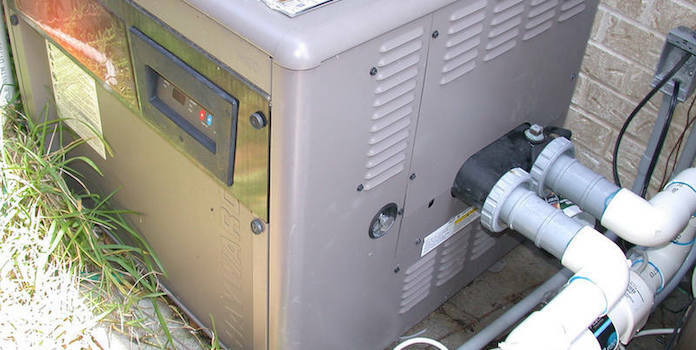 Heat Pumps – For an average 140,000 BTU heat pump with a cost of nearly $3000, you’ll pay about $.91 per hour to run the pump at average electrical prices. You should expect your pool to go up about 1.66 degrees each hour that you run the heater. To compare it more evenly to the others, the pump will cost you $2.74 to get that same 5° temperature increase and it will take a little longer. As you can see, those are some seriously quick temperature increases accompanied by some seriously high equipment and running costs. If the price is no object, go ahead and place an order for one of the above methods. If you are a bit more cost-conscious or simply want to harness the sun’s natural power to provide an easier solution for your heating needs, then read on to discover a few ways to create your own DIY pool heater! Heating water with the sun isn’t rocket science. We all know that water will naturally absorb some of the energy from sunlight, and any pool will eventually get warmer as the outside temperature rises and we start to get more sunny days. The problem is that your pool has a LOT of water in it, and the sun only warms the surface water of the pool. What we need is a way to take some of the water out of the pool, heat it up, and then dump it back in so that the entire pool starts to get a little warmer. We also want to do this as cheaply and efficiently as possible. Please note that, in regards to speed and convenience, none of these methods can replace a dedicated heater powered by fossil fuels. However, if given a little more time you should be able to enjoy similar results at a tiny fraction of the cost and carbon footprint. Let’s figure out what will work best for you! Ok, I know what you’re thinking. Why would you start off a DIY pool heater guide with a ready-made option? Well, these ready-made solar panels are only ready-made in the sense that you don’t have to construct the solar panel itself. You still need to put together the heating system yourself. Also, they aren’t solar panels in the sense of photovoltaic energy, but rather they use the sun’s energy to heat water as it flows through a “panel” constructed of small black tubes. These panels need to be placed, mounted properly, and hooked up to your pool in such a way that water pumps out, runs through the panels, and flows back into the pool once it has been warmed. Typically, people will either mount these on the ground at an angle near the pool or, if their pump is big enough, they might install them on their roof near the pool to minimize the amount of space they take up. There are a lot of variables involved in how you might want to set your own up, but most are similar to the picture below. Note that they feature a conventional pool heater, strainer, and filter in the mix, but these are optional depending on your needs. We also recommend that you install some type of valve to ensure that you can stop water from going through the panels once the pool is getting warm enough on its own during the summer. PEX piping under aluminum fins – Using PEX tubing to create a system sandwiched between aluminum fins, these panels produce about 22,750 BTUs per DAY. With eight of the panels strung together, the system pumped 182,000 BTUs into the pool, which raises the temperature of a 10,000-gallon pool about 2 degrees per day in ideal conditions. Piping grid inside a wooden frame – This builder (see video below) made a wooden frame into which he placed a 2-inch header and footer made from PVC along with about 250 feet of tubing running between the two. He piped it into his pool filter pump with a Y-joint so that he can turn it off and on quickly. Below is a video of it in action. Instead of running tubing through a “solar panel,” many people opt to use the simple power of a black hose in various configurations to create as much surface area as possible to run their water through. The hose, or polyethylene pipe, is coiled to make solar “discs” that can be laid out on the ground, mounted to an array, or placed on a roof to maximize sun exposure. Some people even incorporate these into landscaping around the pool! As you can see, both systems above use long lengths of black tube that absorb heat from the sun. Pretty simple, right? How much money you can save by implementing one of these simple systems depends on too many factors to outline them all here: weather, temperature, hose length, hose diameter and material, and original water temperature are just a few. That being said, with materials costing less than $40 and just a little of your time, it’s hard to see how you wouldn’t benefit from this system if you used it regularly! Up until this point, we’ve been talking about getting cold water out of the pool, heating it up, and then adding it back in to increase the pool temperature. All of these methods work very well for this purpose, but they aren’t doing much to help retain that heat at night or during periods when you aren’t using the pool. Keeping that water warm is where pool covers excel. Depending on the material used, pool covers can work with your heater to help warm the pool. According to the National Renewable Energy Laboratory, pool covers can reduce the energy required to heat a pool by as much as 50-70% because they help retain so much of the heat of the pool, as well as reduce evaporation – another huge heat loss culprit. There are lots of ready-made pool covers to choose from, and many have options to fit your exact pool size if it is a standard shape and dimension. If you can find one that fits your pool closely, these are great, inexpensive options that will help you avoid the hassle of making one for yourself. These covers typically employ transparent blue plastic wrap with “thermal bubbles” that allow for heat to reach the pool water but retain as much of that heat as possible after the light passes through it. This stuff is pretty much a giant sheet of bubble wrap, but unfortunately (or fortunately) you won’t be able to pop these bubbles to help pass the time until you can swim again! If you don’t want to mess with regularly taking a large pool cover off and putting it back on again, there are also pool cover “floats” that use the same type of material but are smaller and designed to float around. Depending on your situation, you might need several of these to get adequate coverage! To create a DIY cover that can help heat your pool, it can be as simple or as complicated as you want to make it. The basics involve purchasing the same type of thermal plastic material used in commercial covers and cutting it to fit your pool’s dimensions. Water and Electricity Don’t Mix – When dealing with electric pumps to move water through your solar system, please ensure that you are using pumps that are designed to be submerged or otherwise exposed to water! Also, be mindful of the fact that extension cords and the like could easily get wet, even if you think they are out of the way, once kids start splashing around! Many of these methods won’t work below a certain temperature – No matter how much sun you’re getting, if the water temperature and outside air are below 50-degrees Fahrenheit, it’s just not going to work. There are a ton of variables for DIY pool heater effectiveness – Although we’ve attempted to estimate how some of these heaters will work in the real world, unfortunately, there are too many variables to know beforehand how things will shake out. The basic science behind all of these options are solid, but shade, temperatures, the size of the pool, etc. 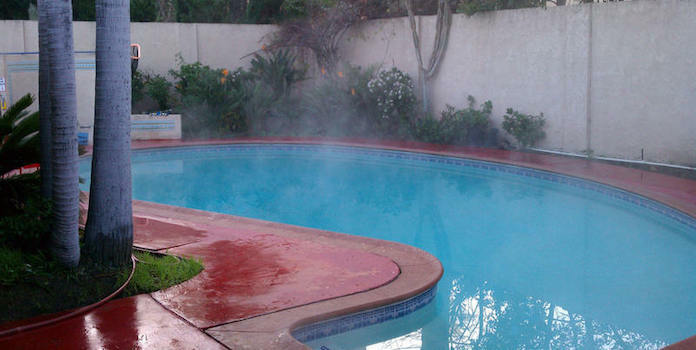 will all affect how quickly and easily these methods will heat your pool. At this point, it should be clear that making a DIY pool heater is an excellent way to save some serious money when it comes to keeping your pool warm outside of peak season. Also, you’ll be helping to save the earth by using the natural power of the sun to replace the fossil fuels of the more traditional commercially-available pool heaters. Try out some options and see what works for you! Also, have a look at our piece about running your swimming pool pumps with solar, and while on the topic of water, take a look at solar water heaters for the house and Hawaii’s take on solar water heaters. Let us know in the comments what you have done to help heat your pool and keep it warm!